So we are all unpacked (except for what needs to go in the attic.. and I am NOT going up there!!) I just need to go shopping and buy a couple more decorations.. because I am totally addicted to them and Russ told me that if I stopped buying them before we moved that after we moved I could buy as many as I wanted and let me tell you.. He never should have said that!! I also just bought our first Scentsy burner and I am in love with it, I will never buy another candle again! 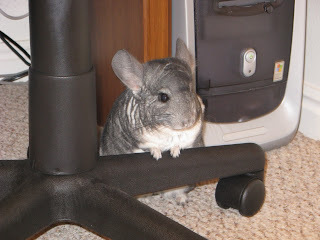 I would put some pictures on here but I am just a little dumb when it somes to computers so as soon as Lacy shows me how I will put some on here (Hint,Hint) Also a lady at work was moving so she gave me her chinchilla! Russ was a little mad when I brought her home but now he loves her he just wont admit it.. We have had her for about 2 months and she is so stinkin cute! Her name is Chinchy and she is crazy, she escaped out of her cage at 3 o`clock in the morning and came in to our room ( but only after she chewed on my brand new entertainment center) she chewed a hole underneath our box springs and was inside our bed chewing on the wood. I woke up and thought someone was breaking in our house, when I woke Russ up he turned the light on and looked under the bed just as she climbed out of the hole that she chewed. I could have killed her but I couldnt stop laughing.